TBILISI, DFWatch–Prime Minister Irakli Gharibashvili met with President of the European Commission José Manuel Barroso to speak about EU-Georgia cooperation, Georgia’s integration process with the EU. Another topic was the deal with the EU Georgia approved last fall, the Association Agreement, and issues concerning its signing in the short term. They also talked about challenges facing countries part of the EU’s Eastern Partnership. Gharibashvili spoke about ongoing processes and reforms in Georgia. The discussions focused on regional security issues, the current situation in Georgia’s relations with Russia, the situation in the breakaway regions and the European Union’s importance in ensuring the security in the region. 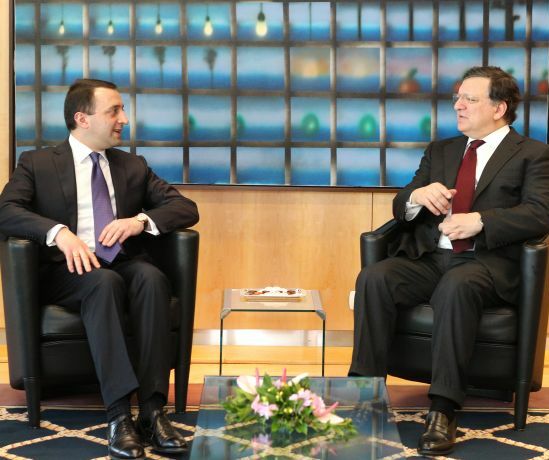 After the meeting, Gharibashvili and Barroso held a press conference together. The PM said the meeting was very interesting and that the EU’s support for Georgia’s European integration course should be appreciated. Barroso said there has been progress in Georgia’s implementation of the action plan for liberalization of visa rules with the EU. He also pointed out that the Association Agreement will be signed within the working term of this European Commission. Jose Manuel Barroso expressed concern about the installation of barbed wire and fences by Russians along the de facto border with South Ossetia and said it is important to continue the dialogue during the Geneva talks; negotiations held about twice a year involving all conflict parties in the 2008 Russia-Georgia war. The PM also met with the European Commissioner for Home Affairs Cecilia Malmström and discussed progress achieved and future plans in visa liberalization. The EU is sending a commission to Georgia in spring to evaluate the process and in implementing the action plan. The PM’s visit to Brussels will end on February 5.